Narrowing in the esophagus. This narrowing can be congenital, or can result from causes such as trauma, surgery, chronic inflammation, cancer, and radiation. 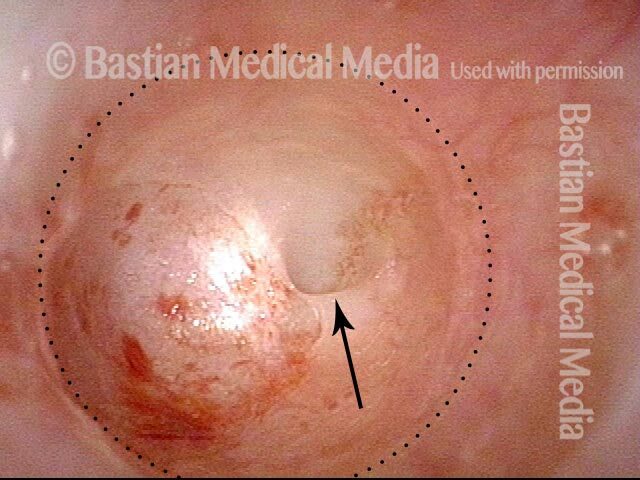 Esophageal stenosis can create swallowing difficulty, especially with solids. A common treatment approach is to begin with dilation (if a malignancy is not present) or a series of dilations, using a balloon dilator. If this measure fails, sometimes a stent is placed endoscopically. This man finished chemotherapy + radiation therapy elsewhere for base of tongue cancer with neck disease, finishing a year prior to this examination. Despite swallowing therapy and VitalStim treatments, he was unable to swallow even his own saliva.The actual diagnosis is seen in the next photo. Panoramic view of hypopharynx. 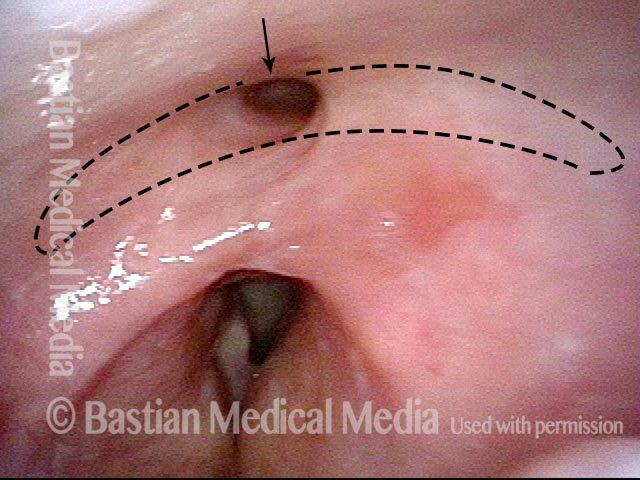 During “trumpet maneuver,” the larynx pulls anteriorly and reveals a stricture of very small size, at arrow. This would normally allow passage of saliva, but in this case it does not. View photo 3 for explanation. The stricture ends as a virtually blind pouch. Here, the scope has been inserted to a distance of nearly an inch into the stricture seen in prior photo, at which point a near-total stenosis is found. The arrow shows a pinhole opening less than a millimeter in diameter. The dotted line shows the expected size of opening at this level.